We live for an Audience of One where the praises at our right hand and criticism at our left meaning nothing. Where I find myself not living for an Audience of One is on social media like Facebook, Twitter, WordPress, etc. I see others on Facebook posting similar things like myself and I don’t get any responses. I have family I rarely see and I see them commenting and liking what my other family members post but I get nothing. No love. No recognition. And because of this I sit in a speculatory mindset rehearsing ghost thoughts that appear, disappear, and then reappear. I make my Facebook and WordPress posts report cards on my life and where I look for worth and value. Genesis calls it looking to the ground and the work of my hands for worth. I mean people strive daily for the sake of others and to try to impress someone who has no bearing on their life. We judge our existence based upon someone else’s Photoshopped life. We live to an audience of thousands. If you give someone the power to validate you, you also give them the power to invalidate you. Other people are not the report card on your life. We may be surrounded by a great cloud of witnesses but we live in the favor of One Witness. Forget your posts, blogs, likes, shares, comments, praises, criticisms, and labels of others. Consider them dung or worthless apart from receiving the affection and affirmation of your Father in Heaven. His report card on you is the finished word of Christ! When He sees you He sees Jesus, when He sees Jesus He sees you. Simple. 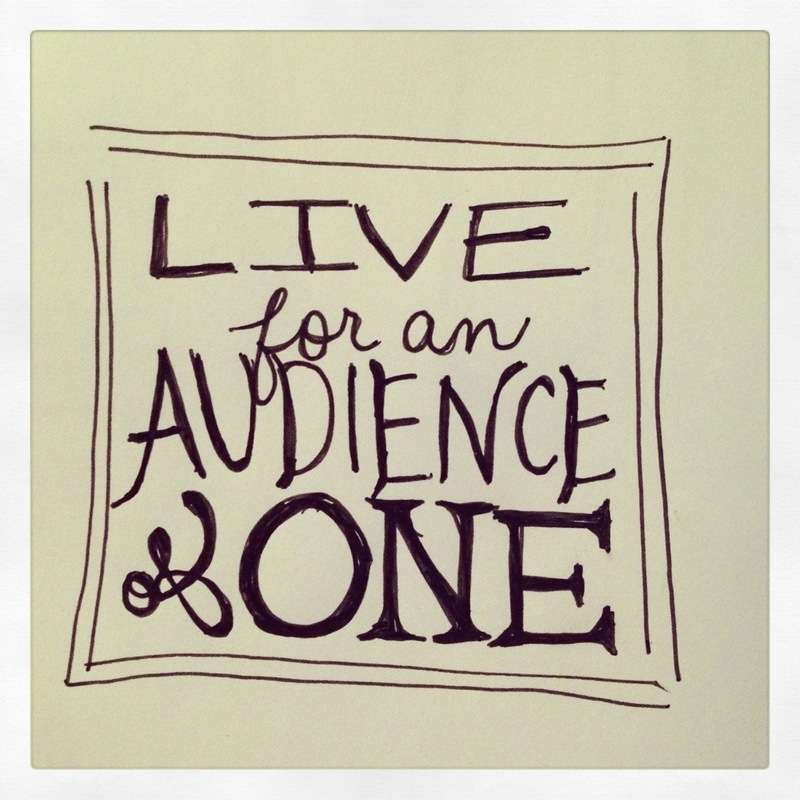 We live for an Audience of One. Not just an Audience but a co-worker, co-laborer, co-everything. He is with us, in this together. Lets begin to live like it.